Canadian Association of Medical Radiation Technologists | CAMRT Annual General Meeting - attend virtually! CAMRT Annual General Meeting – attend virtually! Home Uncategorized CAMRT Annual General Meeting – attend virtually! This year, the CAMRT will be broadcasting its 2019 AGM to members who wish to attend across the country via live stream. This will give those who attend the chance to watch the meeting in real time and take part in the meeting through its question and voting functions. 1- Register to attend Only CAMRT members are allowed to vote on CAMRT business. As such, it is important for us to verify CAMRT membership for attendance. The sooner we can know the number expecting to join the better, as this will help us in planning for support on the day. Once your registration is verified, you will receive an email with your personal login information. We can’t stress this enough. The GoToWebinar platform is a very effective platform, designed to work using the latest and most widely used technology. If your system or your web browser is out of date, it may need an update to work with this webinar platform. GoToWebinar provides a simple and comprehensive tool to check your system and your browser for compatibility. Check your system and browser ahead of time to detect any problems and address them before the broadcast. 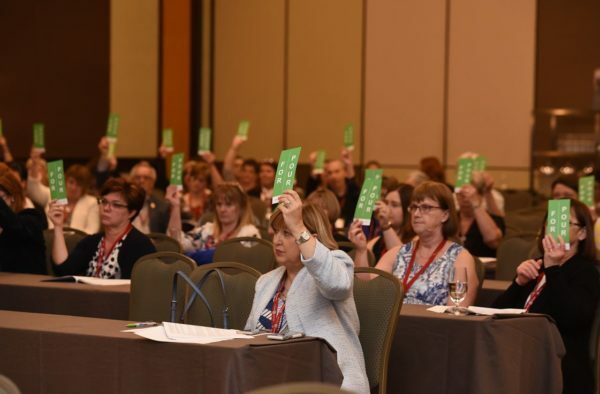 The documents required for the Annual General Meeting will be included in the 2019 AGM Workbook, a comprehensive document containing relevant information and reports discussed during the meeting. Copies of the AGM Workbook are provided to all annual general meeting attendees. Should you be unable to attend the Annual General Meeting, and wish to register your vote(s) in advance, please contact Myrtle Shields at mshields@camrt.ca. Please note that advanced votes will not count if motions are amended or changed at the meeting.